Good morning, everyone! Today after work we have a team networking dinner at our executives house. I am really excited to get to spend some more time with my team and get to know people better. Since we have a team event I wanted to look more professional. We can wear jeans at my work, so I know I will be more dressed up than most people there. Dress for the job you want, not the job you have! 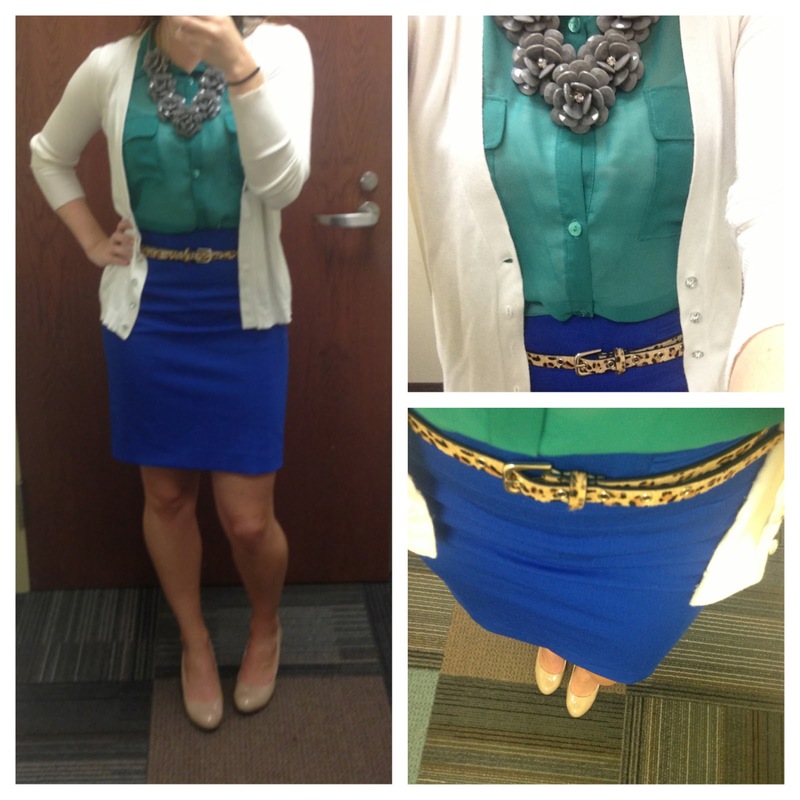 This is one of my favorite outfits I think I have worn in a long time! I love the color blocking in this look. Blue and green compliment each other really well. When I first bought this skirt, I was not sure what all I could wear with it. It was too good of a steal on black Friday to pass up so I snagged it anyways! I have had SO many outfit options with this look. Pretty much every color top looks good with this cobalt blue pencil skirt! And as always, leopard is my favorite and go-to way to make an outfit more fun :). I love blue and green together, I think it's such a pretty combo. trung tâm ngoại ngữỗn Thế Ma Vương nói, nhưng là cũng đại khái nghe được rõ ràng, nguyên lai cửu khỏa linh châu các tộc là ở trong tay Nhạc Thành, tất cả mọi người còn tưởng rằng đã đánh rơi ở tại cổ động rồi. - Nhưng ta không giao cho ngươi đâu. Nhạc Thành nhìn Hỗn thế lão ma nói. - Ta đây cũng chỉ vì nó, đến lúc đó làm cho ngươi ăn không ít đau khổ. Hỗn Thế Ma Vương nhìn Nhạc Thành nói. blue and green is always a great combination and I love your flower necklace. good luck & have fun! So many of my faves here....color blocking, leopard and that necklace!! :) A girl after my heart!! How fun! I am wearing the same neckalce today but in cream! You look adorable! Great skirt. I am loving cobalt blue right now. Yes, what doesn't look good with cobalt? I think the green and leopard is stellar. Great look! Love the colors. OMG!!!! I love this outfit! green and blue together work perfectly! Thanks Darcy for visiting my blog and for the comment. Please note that if you choose to comment with your Google Account your name and email will be stored.